Part of the fun of going to a Garage Sale is that you never know what you will find. Expect to find items typically sold at home garage sales. Examples include but are not limited to are: tools, electronics, toys, clothing, shoes, collectibles, sports memorabilia and equipment, furniture, jewelry, man cave stuff, art, purses, new items, vintage, antiques, primitives, car parts, baby equipment, and home décor. Everything But the Garage also attracts seasoned sellers who have close-out items, records, collectibles such as baseball cards, and unique flea market-type finds. A few vendors will be selling direct sales products such as Tupperware, LuLaRoe, Avon, Papparazzi, etc. We have a few commercial sellers offering goods and services as well. Generally, there are over 150 sellers filling up the inside the Fredericksburg Expo and Conference Center. That is the equivalent of just under two football fields of stuff all under one roof. In the past Goodwill has provided a limited number of reusable shopping bags on Saturday morning. We hope to have them at the Sales but are not promising they will be available. They go fast, so please come prepared with your own bag(s) and / or small cart. Staff is available to assist moving large item (anything that can’t be hand-carried) to your vehicle. For assistance, visit the Exhibitor Services desk near the concession area or ask any of the staff manning the entrance and exit doors. For your convenience we encourage Large items NOT to be moved out through the front doors. You can get your hand stamped and exit the main doors in the front of the Fredericksburg Expo and Conference Center. You may re-enter the same day as many times as you’d like. The Fredericksburg Expo & Conference Center has FREE on-site parking! 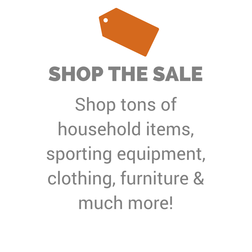 Enter the sale through the main entrance at the front of the Fredericksburg Expo and Conference Center. An early bird ticket is a ticket purchased in advance and allows the bearer to enter the sale 30 minutes before the general public on the first day of the sale (Saturday). EARLY BIRD TICKETS HAVE SOLD OUT FOR THIS EVENT - GENERAL ADMISSION TICKETS ARE AVAILABLE AT THE DOOR FOR ONLY $4. All found items are taken to the box office and are held there until the end of the show. After the close of the show, they are turned over to the Fredericksburg Expo and Conference Center Facility Management team, who at their discretion will hold the times for an short period of time.